Export Order Items Pro for WooCommerce generates in-depth data exports that provide details of customers’ product purchases. With the Export Order Items Pro plugin, users can export order details for use in order fulfillment and data analysis applications. The plugin facilitates both manual data processing as well as data import into accounting, fulfillment, and analysis software applications that do not support direct integration with WooCommerce. Incredibly easy to use, Export Order Items Pro for WooCommercelets users generate reports both quickly and easily. Reports can export data into a range of formats (XLSX, XLS, HTML, and CSV) or further analysis in compatible software. Similar to Product Sales Report Pro for WooCommerce, the Export Order Items Pro plugin provides granular details relating to individual orders and customer information, whereas Product Sales Report Pro for WooCommerce gives an overview of sales and product sales totals. Select from a variety of predefined data fields that can be included in the report. Filter line items by order status (Pending Payment, Processing, Completed, Cancelled, etc.). Create multiple export presets to save time. Include custom fields defined on an order, product order line item, product, or product variation. Limit the export to only include certain product IDs or product categories. Change the names and order of fields in the report. Export in XLS, XLSX, or HTML format (in addition to CSV). Integrates with the Extra Product Options Addon for Export Order Items Pro plugin to export an fields from the WooCommerce Extra Product Options plugin. The Export Order Items Pro plugin has a clean interface that integrates with the native WordPress aesthetic. After installation and activation, the plugin will create its own menu item in the WordPress dashboard. Lightweight and powerful, Export Order Items Pro for WooCommerce is easy to use. The plugin uses a number of tabs for the settings, making navigating through the plugin both quick and easy. Each of the different settings tabs include various report options. Using the Order Filtering tab, users can decide which order related variables determine the orders to be included in the report. In terms of order date range, users can select from a number of predefined date settings, or set their own custom date range. Next, the user is able to filter the report based on the respective order statuses they’d like to include, for example, orders that are pending payment, processing, refunded, failed and more. Reports can also be refined to include orders with specific field values. These fields, as stored in the WooCommerce database, allow the user to display data from very specific orders in the report. Finally, the user is able to filter the report based on the customer’s user role (Customer, Administrator, etc.). 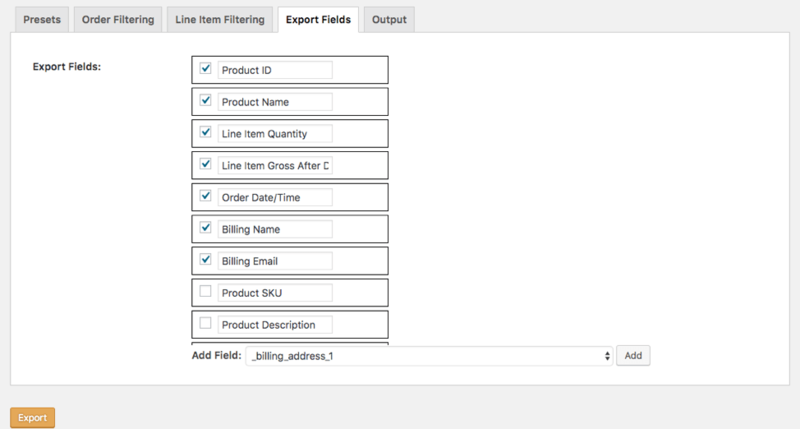 The Line Item Filtering settings tab allows users to refine reports based on product variables. Here, users can choose to include specific products in the report, either by selecting specific product categories, selecting specific product IDs, isolating particular tags, or selecting products based on certain fields. Also within the Line Item Filtering settings tab, users can choose whether to include shipping line items, line item refunds, custom order line item types (such as coupons) and more within the report. In the Export Fields settings tab, the user is able to decide which fields they would like to include in the report. Fields have been suggested as a default. Fields can be renamed, and selected or deselected by ticking the checkbox. When the report contains a totals row, the fields to include in the totals row can also be selected in this tab (except certain non-numeric fields which have been excluded). 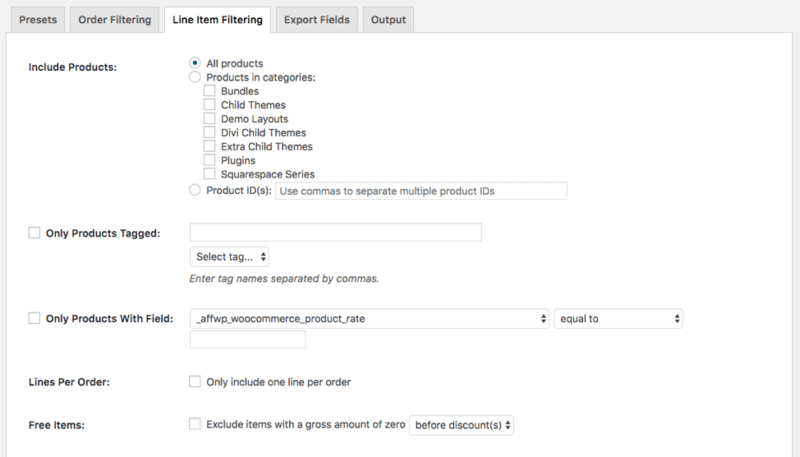 Besides the fields built in to the plugin, the user is able to add additional fields from their WooCommerce database by selecting from the Add Field dropdown and clicking Add. Again, the field can be renamed at will. The Output settings tab includes a number of options to better format the report. Here, the user is able to choose whether to sort by Order ID or Product ID, decide whether they’d like to include a header or totals in the report, and also determine which format they’re like to export the report into. Supported output formats are XLSX, XLS, HTML, HTML Enhanced, CSV – ASCII, and CSV. The output file can be imported into compatible software. Finally, the Presets settings tab stores all of the user saved presets. The Create New Preset option is available throughout all settings tabs of the plugin, making it very easy for the user to create a preset as they are working. All saved presets will be stored in the Presets tab for easy access. Here, presets can be actioned, edited, and deleted. Please note: The screenshots are from version 2.0.15 of Export Order Items Pro WordPress Plugin. For the latest feature list update of version 1.0.1 please refer to this blog post.